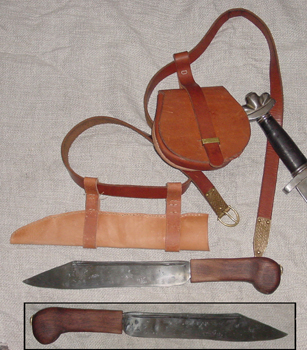 To the left, we see Rolan's belt, pouch, seax and sheath. The belt is a one inch wide belt with a stamp embossed belt tip. Rolan's seax has an eleven inch blade and a black walnut grip. Here is the detail of the buckle and mounting strap all of Rolan's making. 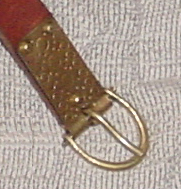 A pattern has been embossed on the strap with iron stamps and chisels. Detail on Rolan's hand forged seax. The blade was forged by Lodin and the grip was made by Rolan. The grip is secured with a bronze washer and the iron tang was then peened. The blade is approximately 11" long plus the length of the grip.